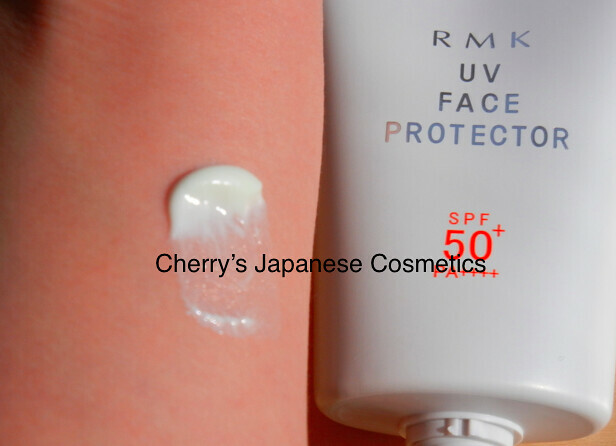 In this Spring Summer 2014, RMK changed their sunscreen. Let me show you this product on my arm. The cream is yellow white, but on my arm, it never change my skin color, and there are no glitters or something. 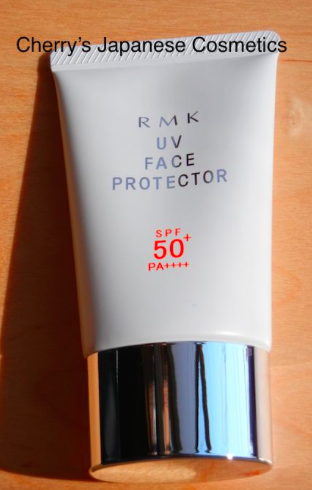 I dislike the smell of sunscreens, but this RMK UV face protector 50 has no perfume. I have to admit some chemical smell. I prefer this than cheap perfumes. I also often get sting with using sunscreens. I have to admit there are quite small pain just after using this RMK when I am sensitive, it goes pretty quickly. When my skin is usual healthy condition, there are no pain with applying this sunscreen. For me, I do not feel this product is neither oily nor dry now. Let me show spray Avene Water on my arm with this sunscreen. This product is not waterproof. I wish you can see there are white part on my arm. I sweat a lot, it may not for me when it gets hot. In previous formula, it was 30g and SPF43. But in this latest formula, it is 50g and SPF50. The price is a little bit higher, but cheaper per 1g.